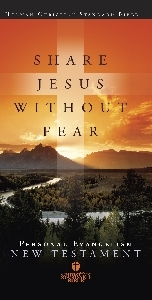 This coming Sunday Morning - March 27 - everyone in our Worship Service will receive a "Share Jesus Without Fear" New Testament. This special New Testament is designed to help you to share your faith in Jesus with others. It has helps in the back that assist you in talking to people about the Good News of Jesus. During the sermon time, we will walk through the verses of Scripture you can use to share Jesus without fear! Invite someone to come with you and be a part of this special service.